delicious inspiration. : Teacakes with Springy Glaze. This morning Buffalonians woke up to the ground covered in snow. Disappointing, of course, but not a big deal. I shoveled the heavy, wet snow off of our driveway by 11AM and thought "Yeah, take that, snow!" Not an hour later it started snowing again and hasn't stopped since. I can't help but be discouraged about spring being here when I look out my window and all I see is falling snow and everything covered in white white white! What's all this complaining about? I hate to admit that the weather affects my mood, but it most certainly does. Winter weather gets extremely tiresome, even to Buffalonians and people who are used to dealing with cold, snowy, messy weather. What's the best thing to do in situations like these? Create something that makes you happy. 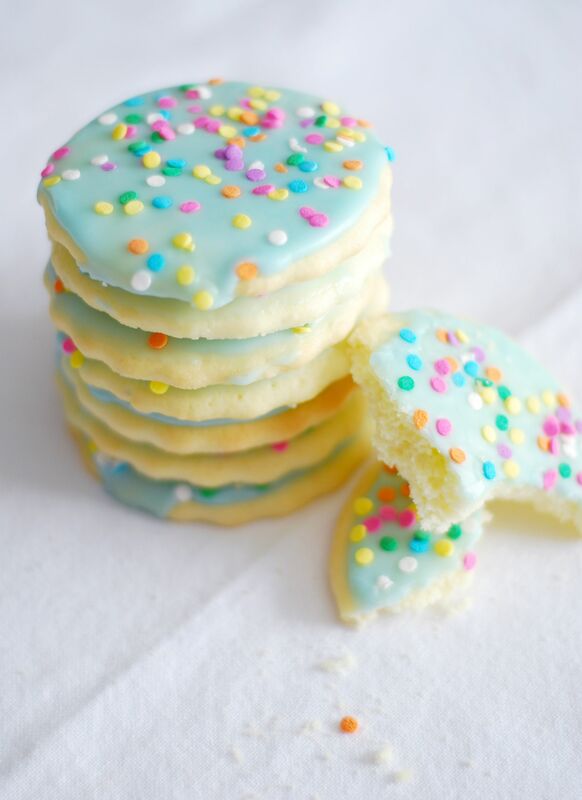 In my case, tender cookies with a springy sky-blue glaze and pastel confetti sprinkles. Preheat the oven to 400 degrees F. and line a few baking sheets with parchment paper. In a large bowl, cream together the butter and sugar until light and fluffy, adding the eggs one at a time and then mix well. Add the vanilla extract, then the flour and stir until everything is well incorporated. Drop by tablespoonfuls onto the baking sheets and bake until lightly golden on the outside, about 8-12 minutes. Let cool completely on a rack before glazing. In a small bowl, whisk together the sugar and water, adding as much as you need to get a thin, pourable glaze. 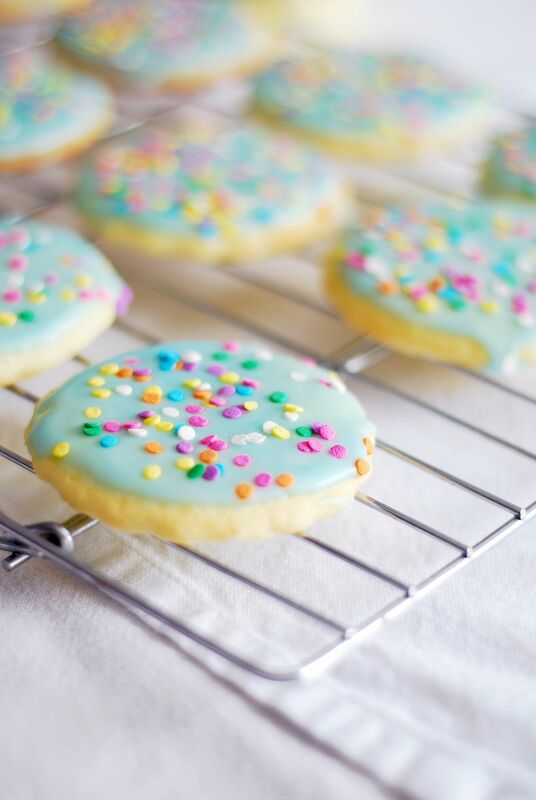 Add the food coloring until you get your desired shade of happiness, then dunk the cookies in and let them dry on a cooling rack, sprinkling away before the glaze sets. North Dakota also got about a foot of snow last night in a big blizzard. Even though I'm longing for spring to come, I guess I can't complain about one last snow day. It's a good excuse to stay in and bake (and eat too much sugar)! Wow! They look super appetizing! I love the colour you chose for the glaze. I love the simple goodness of the recipe - a must try for the Easter tea party season over here. I feel you on winter. We just moved from Ontario to the UK, so not much snow anymore - but just the thought of slushy roads makes me shiver! Aww, these look so perfect for spring! These look absolutely lovely, I can't wait to try them. I just made these cookies and mine did not spread out on the pan. :-( They are the same shape they were when I dropped them on the cookie sheet. Not sure what I did wrong. I am wondering if I should have rolled them out or maybe chilled the dough. My granddaughter and I made these cookies today. We used orange flavoring instead of vanilla and they were absolutely delicious. I had the same issue as "Anonymous" with my 1st cookie sheet full. The next sheet full I wet a spoon with water and smoothed the dough out to the thickness and shape desired. The results were more like the ones in the photo. We are going to use orange frosting to go with the orange flavoring and to represent the nice fall feeling that we have experienced here in Alabama over the past couple of days. I have made these , at each of my grandchildrens joust since pinned, these are to die for good, I added a tsp of almond! Gaining weight ! 1.12.13 These look delicious and are so pretty. What do you mean by "dunk the cookies in"? How did you apply the glaze? Thanks. Hold the cookie upside down over the bowl of glaze and dip just the top. Depending on how thick you want the glaze you should continue to hold it upside down over the bowl to let some of the excess glaze drain off if you like. I made sugar cookies at Christmas that didn't quite taste right, so I'm wanting to try again. 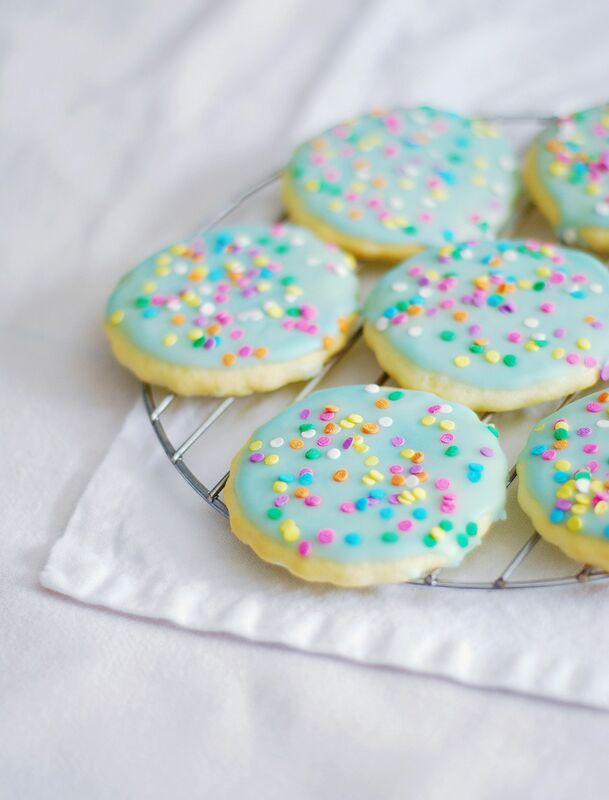 This recipes looks perfect and the cookies look delicious! Thank you! Marvellous cake!!!! We enjoyed our party with this awesome cake, Thanks for sharing this wonderful recipe. Thanks alot!!!!!!! Banana Pistachio Cakes with Guava-Pear Compote. 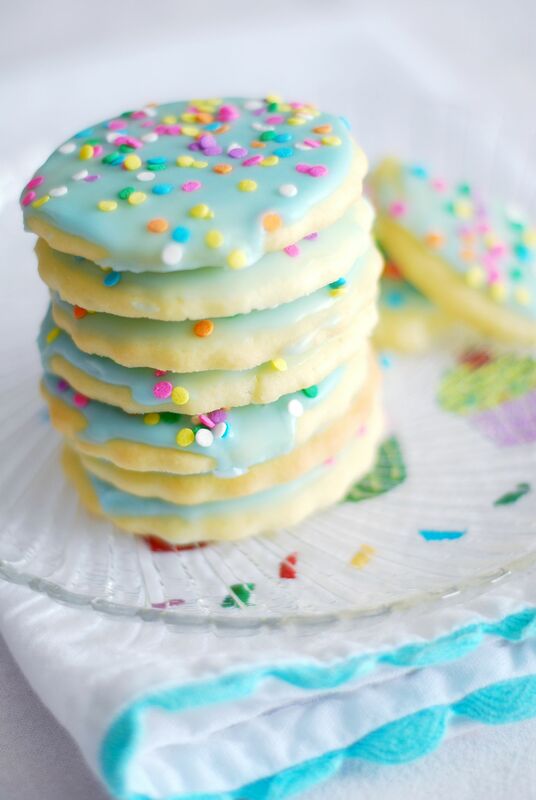 Old Fashioned Soft Sugar Cookies.